Do you like those nice emails with a graphic on one side and data on the other? How is that done? Tables! For emails particularly, best practice is to use tables to organize the presentation of information. Best of all, most (if not all) email clients understand tables and will present the data the way you planned. To create a table, click on the table icon in the editor toolbar. 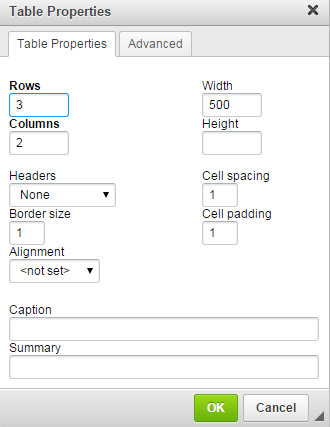 Once you create your table, there are additional features to edit the size, color, etc. Below is an overview of all Table Properties tab elements. Width – the width of the table in pixels or a percent value. The default is 500. If you are working with an email, we recommend making this 600. Border size – the thickness of the table border in pixels. Change to 0 if you don't want a border.